I was in Copenhagen last week (March 28-29, 2019) to give a presentation on “Politics and Organization in the Eurozone Crisis: Does the Politicization of Organizational Interaction make for more or less legitimacy?” at an inaugural workshop on Rethinking Politics in Organization at the Copenhagen Business School. I was one of three keynote speakers to present work relevant to questions pertaining to politics in organization studies, how politics organizes an electorate in ways that produce populist leaders, nationalisms, etc. How to explain Trump, Erdogan, Orbán, Johnson, or Le Pen? What resources are there in organization studies to develop an understanding of politics, or what we might call politics-in-organization? What role does management or entrepreneurship play in these wider social and political forces? What role the corporation, the family firm, the military? And what of the grounding organizational configurations of technology? The workshop launches a three-year program of activities devoted to the development of politics in organization studies, or ‘organizational politics’. The purpose of the gathering was to make connections between people interested in the broad area of politics and organization and to explore joint interests, develop concepts and novel perspectives, and build topics and reading lists for research and future seminars. This morning I gave a keynote lecture on “Europe’s Crisis of Legitimacy: Governing by Rules and Ruling by Numbers in the Eurozone” for the EU Horizon 2020 research network RECONNECT at the Norwegian Embassy’s Norway House in Brussels. Although ‘Brexit’ and the refugee crisis have grabbed today’s headlines, the European Union’s sovereign debt crisis continues. The Eurozone’s comparatively poor economic performance and continued political divisiveness have combined with processes focused on ‘governing by rules and ruling by numbers’ to generate an on-going crisis not just of economics and politics but also of democratic legitimacy. I argue that the EU’s (euro) crisis of legitimacy centers on problems related to (a lack of) policy effectiveness, political responsiveness, and procedural quality. But she also contends that in pursuit of legitimacy as much as in response to deteriorating economics and increasing political volatility, EU institutional actors—ECB, Council, Commission, and EP—incrementally reinterpreted the rules and recalibrated the numbers ‘by stealth,’ that is, without admitting it in their public discourse. To theorize about such processes of ideational innovation and discursive legitimation during the Eurozone crisis, I use the neo-institutionalist framework of discursive institutionalism. I participated this morning (February 22) in an international symposium at the Körber Forum in Hamburg Germany on occasion of what would be Helmut Schmidt’s 100th birthday. The event — “Rethinking Europe: Celebrating Helmut Schmidt at 100” — was organized by the Federal Chancellor Helmut Schmidt Foundation. I spoke on a panel entitled “Keeping Europe United: Institutional Remedies for Countering Anti-EU Populism” along with Anna Diamantopoulou, President of the DIKTIO Network for Reform in Greece and Europe and former EU Commissioner and Greek Government Minister; Simon Hix, Harold Laski Professor of Political Science at the London School of Economics and Political Science; Ivan Krastev, Chairman of the Centre for Liberal Strategies in Sofia and Permanent Fellow at the Institute of Human Sciences in Vienna; and Pascal Lamy, President Emeritus at the Jacques Delors Institute, former EU Trade Commissioner, and former Director General of the WTO. The session was moderated by Henrik Enderlein,President and Professor of Political Economy at the Hertie School of Governance and Director of the Jacques Delors Institute Berlin. On Wednesday, February 20, I gave the annual Max Weber Lecture at the European University Institute on “The Rhetoric of Discontent: A Transatlantic Inquiry into the Rise of Populism.” The lecture was introduced by Stefano Bartolini and chaired by Mirjam Dageförde. The rise of what is often called ‘populism’ constitutes the biggest challenge to liberal democracy since the 1920s or 1930s. The voices of populist dissent speak in different languages but mostly convey similar messages-against globalization and free trade, immigration and open borders, Europeanization and the euro. 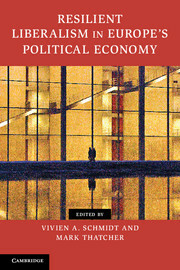 They draw from the same range of sources-the economics of those feeling ‘left behind,’ the sociology of those worried about the ‘changing faces of the nation,’ and the politics of those who want to ‘take back control.’ And they employ rhetorical strategies via social media to create ‘post-truth’ environments that reject experts, demonize conventional political elites and parties, and excoriate mainstream media while using them to amplify their messages. The question is: Why and how have populists had such success today in channeling public fear and anger? Scholars often respond by focusing on the sources of discontent—economic, social, or political—and trigger moments. But a complete answer demands an investigation of what populists say, meaning the substantive content of leaders’ ideas and discourse; how they say it, involving the discursive processes of interaction via activist social movements, party networks, and direct links with ‘the people;’ and what they do, in opposition and/or in power in their differing national contexts. Ahead of the lecture, I talked with Mirjam Dageförde on the present state of Europe, politics at the time of populism, and what should be the response of academics. A video of that conversation can also be found on YouTube. I just gave a talk on my 2006 book Democracy in Europe for the European Parliamentary Research Service in Brussels. The book itself was named by the European Parliament in 2015 as “one of the 100 books on Europe to remember.” The event, in interview form, was part of their book talk series with authors of important books on Europe. The talk was introduced by the Director-General of the Research Service, Anthony Teasdale, and the Discussant was Deputy Direct General of the Council Secretariat, Jim Cloos. A podcast of the talk is available: http://www.europarl.europa.eu/cmsdata/160480/1003.MP3. Enjoy! On Monday, November 5, I participated in the Summit on the Future of Europe—Back to Square One at Harvard University’s Center for European Studies, presenting on the panel: “The Challenges of European Integration or Disintegration.” Other speakers included John Dalhuisen, Senior Fellow at the European Stability Initiative (ESI) and Kyriakos Pierrakakis, Director of Research at diaNEOsis Research and Policy Institute. The panel was chaired by José María Beneyto, Professor of International Public Law and International Relations and Director of the Institute for European Studies. The Summit on the Future of Europe is an initiative of the Minda de Gunzburg Center for European Studies (CES) at Harvard University. Since 2014, this annual conference convenes scholars and public leaders to debate critical challenges facing Europe. The fifth annual Summit is a partnership of CES, the Harvard Kennedy School’s Project on Europe and the Transatlantic Relationship, diaNEOsis Research and Policy Institute, European Stability Initiative (ESI) and Central European University (CEU). I was in Vancouver recently to deliver two talks. On October 18, I gave a presentation on “The Rhetoric of Discontent: On the Transatlantic Rise of Populism” at Simon Fraser University’s political science department. On October 19, I gave a presentation on “Europe’s Crisis of Legitimacy: Governing by Rules and Ruling by Numbers” as part of the Institute for European Studies “European Transitions Series” at the University of British Columbia. On October 11, I gave a talk on “Europe’s Crisis of Legitimacy: Governing by Rules and Ruling by Numbers in the Eurozone” at McGill University’s Jean Monnet Center. The lecture was recorded and is available on YouTube (see below). The policies and processes adopted by the EU in the face of the euro crisis have in fact exacerbated long-standing problems of EU legitimacy and solidarity. Democratic legitimacy has suffered because Eurozone policies have failed to produce good outcomes and because EU citizens have even less say than ever over those policies. Indeed, the excessively intergovernmental processes of Eurozone crisis governance—in which the European Central Bank acts, the member-state leaders in the European Council decide, the European Parliament is side-lined, and the European Commission serves as a secretariat—have unbalanced the EU’s long-standing “democratic” settlement in which all three latter institutions pulled their weight. By “governing by the rules” and “ruling by the numbers,” EU institutional actors seem to have forgotten that democratic legitimacy demands not just rules to follow but policies that both work and appeal to the citizens. On Oct 7, 2018 I participated on the panel “Germany’s Role in the European Union and the Transatlantic Relationship:1998-2018” for the Twentieth Anniversary Celebration of the Center for German and European Studies at Brandeis University: Reflecting on the Past, Envisioning the Future: The Center for German & European Studies at Brandeis turns 20. The panel explored how Germany’s role in Europe shifted between 1998 and 2018, what it means, what effects Brexit and right-wing populism are having, how the EU is dealing with these challenges, and what will likely happen in the coming years. A link to the program can be found here. I was at the University of Tampere, Finland, August 27-29 to deliver a keynote presentation entitled “Theorizing the Power of Ideas and Discourse in Governance beyond the Nation-State” for the Sixth Conference on “Power & Governance: Forms, Dynamics, Consequences” at the Institute for Advanced Social Research (IASR). The agenda of the conference was to probe whether something general can be said about the forms, dynamics and consequences of power and to study what the alternative ways to approach the issue are and what kind of irreconcilable contradictions there are. Plenary sessions were held on the following topics: power relations, global governance, power and knowledge, and critique of power.